For many business, indoor lighting is one of the most important decisions to be made. Equally important, however, should be how the outside is illuminated. For potential customers passing the building at night, or walking through the parking garage, the outside will be their first impression of your establishment. While HID lamps have been the standard outdoor lighting option for years, LED canopy light fixtures help provide many options to create a safe and inviting environment while greatly reducing both energy use and lighting costs. LED manufacturers made sure to provide many options to address a myriad of commercial lighting needs. 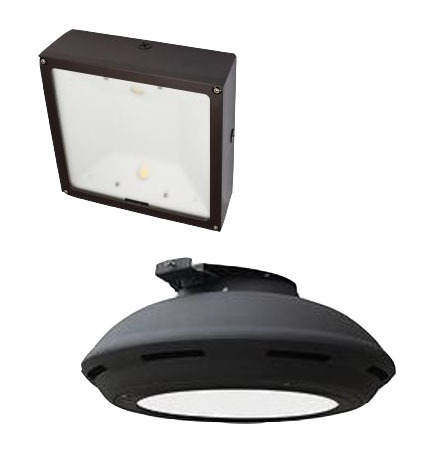 The LED fixtures are available in two different types: Parking Garage Distribution and Canopy Distribution. The lamps also come in different shapes (round and square) to make the switch simple. The shapes allow multiple choices for mounting: ceiling, arm, and wall mount to name a few. HID lamps generally emit a somewhat orange light color. Their LED counterparts however, provide a cool white light. This gives them a much brighter appearance, and helps foster feelings of safety and comfort where installed. The LED technology allows these lamps to use such low amounts of energy while still maintaining brightness. This is because the brightness is not dependent on wattage, but lumens. The higher the lumen count on a lamp is, the brighter the light emitted from will be. Further opportunities for savings are realized through dimmable and motion sensing lamps. By installing the LED canopy light fixtures, you’ll be cutting energy usage per fixture by up to 80% and as a result, energy costs.